Hanna is the Queen of Productivity. I don’t think there is a Craft or an Art that she has not tried. She’s always pushing her technical capabilities as well. She’s done video tutorials, digital newsletters, on-line classes and she’s a published writer. She’s a whirlwind of inspiration. I’m in good company too! Among others she’s interviewed artist Lori Vliegen (whos blog I love) and new to me Sheila Arthurs (her felt & embroidery pieces are amazing!). Thanks Eden for the chance to be included on your blog among your own pretty artwork and words! 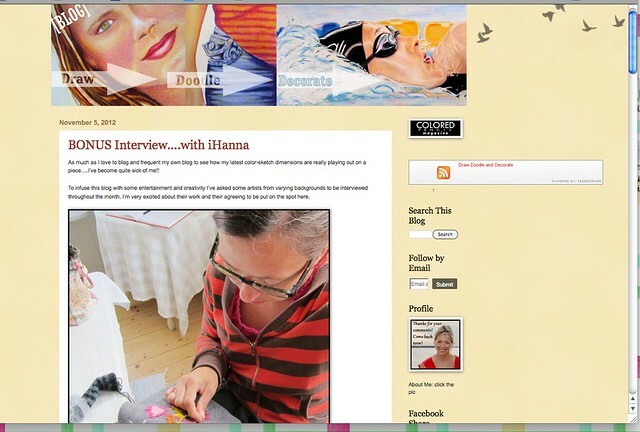 This entry was posted in Inspiration and tagged About Me, artist, blog love, interview. Bookmark the permalink.